A memorable $10,000 suit worn just one time by Indian Prime Minister Narendra Modi – with pinstripes that spell out his name in tiny letters – has sold for 43.1 million rupees ($693,234) at a charity auction. Indian Prime Minister Narendra Modi’s suit which he wore during the visit of U.S. President Barack Obama was on display in Surat on Feb. 18. The winning bidder was Laljibhai Tulsibhai Patel, chairman of Dharmanandan Diamonds, which is headquartered in Mumbai. He bought the suit at an auction in the western Indian city of Surat on Friday, according to Rajender Kumar, a senior official in Surat, which organized the sale. 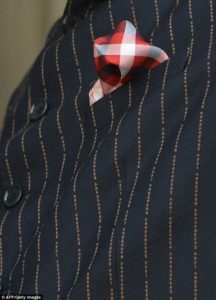 The suit features Mr. Modi’s name, embroidered in yellow pinstripes, set against navy-blue wool. The pinstripes themselves repeat the words: “Narendra Damodardas Modi.” Mr. Modi’s middle name is his father’s first name: Damodardas Mulchand, a tea seller. Earlier this month, when the Bharatiya Janata Party– led by Mr. Modi –took a drubbing in state elections in Delhi, some commentators went so far as to lay some of the blame on the pinstriped suit, saying the decision to wear it suggested that the prime minister was out of touch. The two-piece suit was put up for auction on Wednesday along with 454 items given to Mr. Modi as gifts since he took office in May. This isn’t the first time Mr. Modi has auctioned off gifts he has received. As chief minister of the state of Gujarat for more than a decade, Mr. Modi held regular auctions of gifts, donating up to 950 million rupees to charities that work to educate girls, according to Mr. Torawane. The proceeds from this auction will go to the “Namami Gange Fund,” a project to clean the Ganges river. “Obviously this time the point of attraction is the suit,” Mr. Torawane said mere hours before bidding ended Friday. Most bidders have been from Gujarat’s business community — diamond merchants, textile-factory owners and real-estate executives. 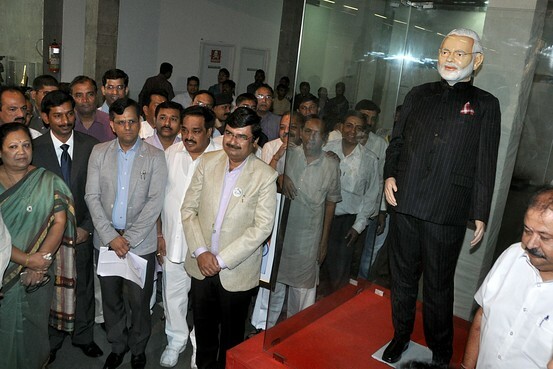 The price climbed steadily through Friday, the final day of bidding as buyers and onlookers gathered around a lookalike mannequin of Mr. Modi on which the suit was displayed behind a glass case. An icy Niagara Falls drew a small but hardy stream of tourists Friday intent on witnessing the extraordinary crystalline spectacle, if only long enough to click some photos. Weeks of sustained cold had visitors marveling from behind scarves and viewfinders at the waterfalls’ glacial buildup and mist-encased trees and lampposts that looked as though they had been sculpted from snow. “I come here every winter but this is the most magnificent,” said Heather Ferrara of nearby Tonawanda, who, with her husband, Joe, braved a morning temperature of minus 7 that felt even colder near the roiling shore. At Prospect Point, the brink of the American Falls faded in and out of a fog as if the falls were exhaling in the cold. “The mist is more ice pellets,” said Tony Lombardi of Mylan, Ohio, who shed his gloves to take photos while his wife, Amy, warmed up in their van. The Mylan, Ohio, couple decided to celebrate their 22nd anniversary at Niagara Falls after seeing the display on television. 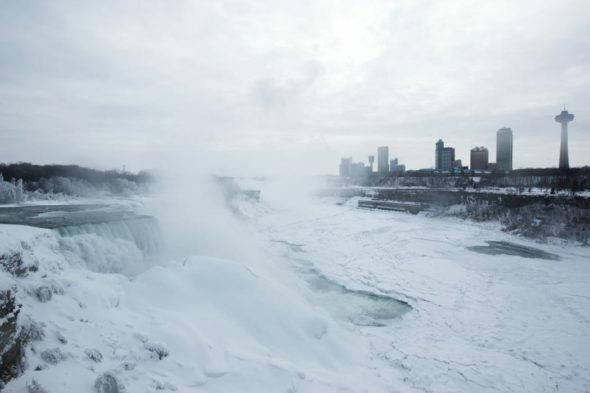 Although sections of the three waterfalls that make up the natural attraction appear to have frozen in place, the Niagara River continues to flow over the precipice to the Arctic-like buildup below. The scene has become a tourist magnet for the second straight year after several relatively mild winters. Forecasters say there will be plenty of time to witness the sight, with nothing resembling a warmup on the horizon. “If you can, you have to see this,” Joe Ferrara said as he and his wife headed back to their car. “But dress warm!” Heather Ferrara warned. The couple wasn’t done with nature yet. They were headed to Letchworth State Park, about 80 miles away in Castile, to take in a 50-foot high “ice volcano” that has formed around a geyser. Princeton University says it has received the largest donation in its history, a collection of rare books and manuscripts valued at nearly $300 million. The 2,500-volume collection includes the first six printed editions of the Bible, an original printing of the Declaration of Independence and Beethoven’s autographed music sketchbook. Anthony Grafton, a specialist in the cultural history of Renaissance Europe and Princeton’s Henry Putnam University Professor of History, called the library a “treasure house” for students and scholars. A Princeton University alum has bequeathed to the school his collection of 2,500 rare books worth an estimated worth of $300 million – the largest single donation in the school’s history, officials said. William H. Scheide, a 1936 graduate, died in November. He was 100 years old. The Scheide Library, housed in the university’s Firestone Library and available to students since 1959, contains the 1455 Gutenberg Bible, the original printing of the Declaration of Independence, Shakespeare’s first, second, third and fourth folios and an 1856 autographed speech by Abraham Lincoln, among others, according to a university release. Scheide’s grandfather, William Taylor Scheide, began the collection in 1865. His son, John Hinsdale Scheide, a member of Princeton’s Class of 1896, added to the collection and built the library in Titusville, Penn., where the collection was first housed, the release says. John Scheide’s son, William Hurd Scheide, started acquiring books and manuscripts for the collection in 1954. The library was moved to Princeton University after the death of William Scheide’s mother, according to the release. The collection has been housed at Princeton’s Firestone Library since 1959. It will continue to be accessible to students, scholars and the public upon request. The library has begun digitising the collection to make it even more accessible. 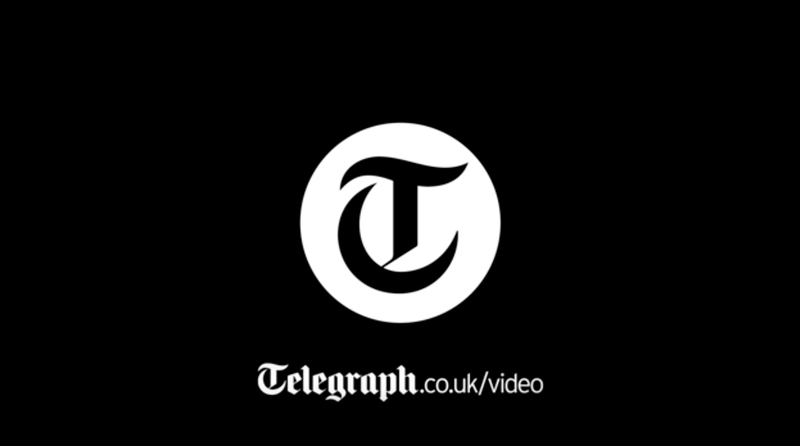 From The Wall Street Journal, YahooNews and NJNews.